I recently set out to make introductory managerial accounting a more effective learning experience for students. The course is typically taken in a student’s first or second year. The range of experiences students bring to the course can be quite diverse. Some may have never been employed, still live at home, and have parents who work in white-collar jobs. Others may have worked and lived on their own, and have family who may own or run a store or work in factories. This diversity means that some students have no mental picture of how goods are manufactured, while others understand the process required to get a product to the customer. Familiarizing students with basic terms such as “fixed” and “variable costs,” or “product” and “period costs,” can be challenging. The textbook my institution uses is well organized. It starts with the basics and eventually progresses to the complex process of making business decisions. However, my students work on learning the material chapter by chapter. When they must analyze in-depth questions, they have difficulty knowing which tools to use and why, even though these tools have already been covered in the text. To help with this problem, this year I recommended that students prepare a reference sheet containing the concepts, how to use them, and what information they revealed. Not a single student took my advice. With each concept introduced, the students get an index card. I write the basic concept on the board and how it behaves or what it is, and then I provide an example. For instance, for break-even analysis, the students write down the formulas, how to calculate the individual components of the formula, how to achieve the sales dollars given the units and vice versa, and what “break even” means. Students keep these cards; they may refer to them when I offer illustrations from the chapter and use them for study outside of class. Students end up with eight to 10 cards by the end of the course. The cards divorce the ideas from the individual chapters and thereby enable students to apply the concepts to more complex business decisions. For example, when deciding if the company should discontinue a seemingly unprofitable segment, students can look at the cards from the early chapters in which basic concepts like fixed costs are defined and explained, and use this knowledge to decide which costs should be considered in making this particular decision. I’m enjoying teaching the course more because during the later half of the course, the students’ knowledge is much stronger. They analyze the choices involved in a particular business decision faster and they start to ask questions about issues beyond the basic course content. This tells me they comprehend the decision and are beginning to see it in a larger context. Are my students’ grades higher? Do I have fewer students failing the course? The first time I tried the approach, grades in the course pretty much stayed the same. However, fewer students failed the course. Normally that percentage ran between 10 and 12. When I used the index cards, only two of the 55 students enrolled in the course failed. The second time, my class average grade rose to an incredible 82 percent and no one failed the course. Am I doing too much to help them learn? Was the last class just more intelligent than previous ones? I’ll have to do further research to answer that question definitively, but for the time being I’m going to carry on. Any technique that helps students apply concepts beyond the chapter in which they’re presented seems like an approach worth continuing. The Healthy Kids Programme aims to promote healthy eating and active living among children. PROMOTING healthy eating and active living must start from a very young age. Healthy eating habits and active living amongst children are cornerstones to their health and well being. This will, in turn, enable them to excel in their academic activities. Healthier children are the foundation for a future generation of healthy Malaysians. In cognizance of this, the Nutrition Society of Malaysia (NSM) launched the Healthy Kids Programme (HKP) in early August. Being implemented in collaboration with Nestlé (M) Berhad, the HKP is aimed at improving nutrition knowledge and promoting healthy lifestyles among school-going children in Malaysia. Education is the single most powerful tool for ensuring that children understand the value of nutrition and physical activity through the course of their lives. Recognising this, Nestlé launched Healthy Kids Programme as a global initiative that uses education as a tool to help educate and empower children to lead healthier lifestyles. The global programme aims to improve nutrition, health and wellness of children through better eating, exercise, and other key health measures such as hygiene. The programme has been running for several years in countries such as Australia, France, Brazil, Russia, Italy and Hungary, and has reached approximately four million children worldwide. In this region, Thailand launched its Healthy Kids Programme with the Ministry of Public Health and Ministry of Education in 2004. More recently, China initiated a Healthy Kids Programme with the Chinese Nutrition Society in May this year. All programmes are designed in collaboration with the national health authorities, health and nutrition professional bodies, child nutrition experts and educational foundations of the respective counties. Other countries that have implemented the programme include Singapore and the Philippines. It is now implemented in Malaysia, with similar objectives, although there may be differences in implementation strategies and activities. by Dr Tee E. Siong. Babies need a lot of sleep. Their sleep patterns do change as they grow. They can learn to self-regulate their sleep patterns. Timing varies with every individual child. It’s important that parents develop a relationship with their babies by supporting their needs. To look after your baby, you must know how to take your baby’s cues. Get to know her well – her likes and dislikes. As you become more confident and familiar with your baby’s signals to you, she too will develop a more regular routine. I believe the nightly routine is synchronised by parent and child. It is found that the more the baby frets, the more anxious the parent gets. This in turn, makes the baby more fussy and cranky because the parent is trying all sorts to stop the fussing. Your nine-week-old baby sleeps a little less than she did as a newborn, about 15 to 16 hours on average. If she sleeps most of these hours at night, she will stay awake much longer during the day. When it comes to duration and the number of naps, it varies with the individual baby. Babies do fuss and cry upon waking up. Although you should still go to your baby when she cries, give her a little time, around five minutes or so. She may settle down on her own and go back to sleep. Or she may want to play and coo. To get her to nap easily, you may want to work in synch with her signals. You need to look carefully at your child and not the time. Your baby can get quality naps when they happen in synch with their natural nap rhythm. Your child may have long or brief naps. You need to be respectful of your child’s individual style and not compare her with other babies. The more you accept her and what she does, you will be able to understand how to soothe her when she needs it. The answer to better naps lies with you and your child. Enjoy your time together when she is awake. Your baby wants a happy mother who knows that everything will be fine. The napping routine will fall into place just like the nightly bedtime routine when both parent and child settle into a regular pattern of interaction. More teachers and care for special needs pupils. MUAR: The Education Ministry is reviewing the education system for special needs students. Deputy Education Minister Datuk Dr Wee Ka Siong said a study into the needs of different types of special students — the visually impaired, hearing impaired and those with learning disabilities — would be conducted. Wee said more teachers would be trained to teach these students, adding that each class should have a maximum of six students. “Providing them with the right learning environment is crucial as these special students have innate talents which can be trained and developed,” he said at the closing of the Muar inter-school Bahasa Malaysia speech competition at SJK(C) Chin Kwang Wahyu in Parit Jawa here yesterday. KUALA LUMPUR, Aug 26 (Bernama) — In the pre-Merdeka years, teachers were among those ‘vocal’ in demanding the nation’s independence from the British colonialists. At that time, the Malays saw teachers as an elite group that also brought a change to the life of the Malay community who were then stifled by the British colonial masters that practised the divide and rule concept among the population. “As early as in mid 19th century, schools that provide education to the Malays began to mushroom and the schools were the early institutions built to meet the colonialists’ obligations based on the agreement that they made with the Malay rulers. “There were many of such schools in Penang and later in the Federated Malay States, followed by that in the Unfederated Malay States,” Datuk Omar Hashim, the Executive Committee Chairman for Malaysian Historical Society (PSM) told Bernama recently. The Federated Malay States were Pahang, Perak. Selangor and Negeri Sembilan while the Unfederated Malay States were Johor, Terengganu, Kelantan, Kedah and Perlis. According to Omar, teachers in the pre- and post-Merdeka years were highly respected by the society. Teachers in that era were the only ones who were literate and able to communicate. They had the knowledge and were seen as being ‘noble’ by the Malay society who lacked almost everything, he said. At the time when the government undertook massive land development projects including that in Sabah for the Federal Land Development Authority (Felda), schools were among the early institutions built. Another institution built that symbolised modernisation was the health clinic, he said. Using the schools as their base, the teachers were active in convincing the Malay community to accept the changes. “Teachers were those who spread the love for education and with the backing of the health clinics, they taught among the easiest of things such as keeping good body hygiene and remaining healthy,” said Omar. He said teachers in the pre-Merdeka years were trained locally such as in the teachers’ training institutes including the Matang Malay Training College (MLMM), Melaka Teachers’ Training College (MPM) and Sultan Idris Training College (SITC). Before Merdeka, teachers were generally seen as the ‘torch bearer’ in education and also for bringing the changes. Even though their number then was not big as now as there were only 50 to 60 teachers who came into service each year, they were seen as the ’saviour’ to the society. According to Omar, the Malays then could only dream of studying up to the level of the teachers’ training colleges and no higher. “Then, there were no high schools for the Malays. Schools for them were only at the primary level and only those who scored excellent results could move on to the training colleges such as the SITC. “Hence these were the people who we can label as the initiators of new thinking in the society. They were religious too. As the teachers then were equipped with knowledge and exposure on independence and they knew the feelings of the suffering Malays, they ultimately became leaders in their respective communities. They became strong supporters of Malay political parties including Umno. “Among them were (Tun) Ghafar Baba, (Tan Sri) Senu Abdul Rahman, (Tan Sri) Khir Johari, (Tan Sri) Aziz Tapa, Cikgu Borhan and many others. It is not an overstatement to say that teachers have played a sterling and strategic role in the growth and expansion of social, mental and political dimensions of the Malays. Omar said in the profession’s early days in the country, the teachers were limited to basic knowledge but their spirit proved to be overwhelmingly strong in bringing education to the Malays. “Salute for the teachers. They were like the ‘unsung heroes’ but had played the major role in developing and moulding the nation’s education sector. “The great effort by this group needs continuity by the present and future generations,” added Omar. by Melati Mohd. Ariff, BERNAMA. The way we teach and learn geometry has to change for it to have any use beyond merely passing exams. The study of geometry is important, as it is recognised as a basic skill in mathematics – for several reasons. Geometric models are frequently used to help students understand basic mathematical concepts. The number line, for example, is helpful to illustrate various number concepts and operations. Geometry is a foundation for study in such fields as physics, chemistry, biology, architecture, engineering, geology and astronomy. Geometric skills are also essential in art, design, graphics, animation, as well as in various aspects of construction work. It has important applications to real-life problems. Many practical experiences involve problem-solving situations that require an understanding of geometric concepts and skills, such as making frames, planning a garden and arranging a living room. In addition, Geometric concepts, such as points, line segments, curves and grids, are necessary for basic map reading skills. Geometry allows development of spatial visualisation which is an extremely important skill for success in mathematics and the sciences. It helps students to understand and appreciate the world they live in. Recognition of geometry as a basic skill in mathematics has resulted in an increased emphasis on geometry in the revised mathematics curriculum by the Education Ministry. Geometric concepts of two- and three-dimensional shapes are formally introduced as early as Year One. Teacher-centred instructions are sadly, still being practised in a typical geometry lessons in our country. by Dr. Chew Cheng Meng. Loyalty and love for a country usually comes from one’s earliest memories, and this writer shares why she is proud to be Malaysian. IF anyone were to ask me how Malaysian I am, I’d say “through and through”. I’ve considered no other country my home except Malaysia. Yes, I know of friends or students who have migrated and made other countries their own, extolled the virtues of their new land and even invited me to make a similar choice. I’m not ignorant of the fact that this country of ours has its shortcomings but then, which country hasn’t? I’ve travelled through India and even visited Sri Lanka. In both these countries, although I recognised words, customs, food and cultural norms that were part of my Indian heritage, I still felt I didn’t belong. But the minute I land in Malaysia and start seeing the familiar rows of oil palm trees dotting the landscape, an overwhelming feeling of relief courses through me — I know I’m home! As a tourist overseas, I’m often asked if I’m from India and my reply is that I am a Malaysian from MALAYSIA. Yes, I am. The pride and spirit in me is that of the true Malaysian. Recently, I read a speech on the Internet entitled “The America We Love” by United States President Barack Obama, in Missouri, the town of Independence, when he was still a Senator, two years ago. These words ring true to me. My earliest and happiest memories are that of playing tirelessly with Malay children of my age, running, laughing, squabbling and eating together. KOTA KINABALU: Only about 200 schools nationwide offer Bible Knowledge subject to their students in the Sijil Pelajaran Malaysia (SPM) examination. The students can sit for the Bible Knowledge subject at 250 examination centres nationwide, 28 of which are located in Sabah. It is hoped that the number of schools teaching and students taking up the subject will increase in the future, said Plantation Industries and Commodities Minister, Tan Sri Bernard Giluk Dompok at the handing over of Bible Knowledge textbooks to 30 schools in Sabah yesterday. The textbooks comprised the Book of Kings and the Gospel of Luke and were an initiative of the United Pasokmomogun Kadazan Dusun Murut Organisation (UPKO) where Bernard is the president. Last year, only 186 students sat for the subject in the SPM examination in Sabah while nationwide, only 400 candidates sat for the paper. The target is to increase the number of candidates sitting for the paper to 2,000 in Sabah. Bernard added that they also hoped for the subject to be recognized alongside other subjects such as English, Geography and Mathematics. Presently, they hope to address several issues that are hampering schools and students from taking up the subject during the SPM examination, he said. “Some people are concerned of the availability of (study) materials for the subject. We want to help them,” said Bernard. As educators we hear and heed Peter McLaren’s warning, “You can’t teach people anything … You have to create a context in which they can analyze themselves and their social formations and lives.” 1 We believe the creation of this context must be our aim as educators, and this context must be balanced between theory and practice. In our pursuit to strike this balance, we believe that experiential education has the potential to assist our fellow educators in transforming their pedagogical practices to more deeply engage their students and improve learning outcomes. Recently, we were asked to share our meaning of experiential education with an audience of educators. We shared this statement: “Most of life’s great lessons are learned through experience. As educators we have the power to frame and facilitate these experiences for our students to grow, flourish, and reach their full potential.” Part of this statement echoes McLaren, yet other words and concepts from our own experience and learning are also present. Cautiously, we are aware that as we embrace experiential education we must not allow the idea of an educational experience to be dichotomized into the ironic and simplistic mantra that students “learn by doing;” as if any “doing” can be divorced from a cognitive thought processes. John Dewey 2 warned us of this as he noted there must be two sides to learning: the psychological and the sociological. Experiential education in theory and practice must embrace both sides of learning, including the cognitive and affective domains as well as the social and physical domains. We believe that students can become deeply engaged in their own learning processes through this holistic approach. 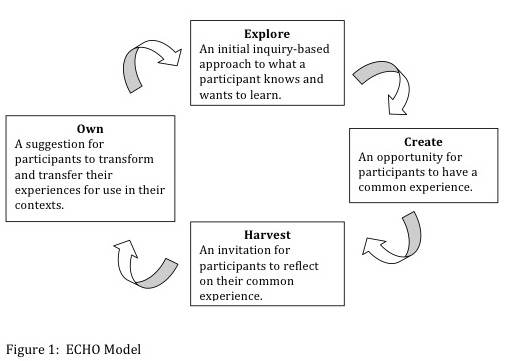 To design learning experiences with an experiential approach calls for an application of John Dewey’s ideas 3 of emphasizing the process of education and development by using one’s experiences as the context for any content. Further, he believed that facilitated reflection on those experiences provided the opportunity for growth and transformative learning to occur. The key for Dewey and for any teaching, presumably, is that an individual transfers her/his learning from one experience into the next. Ultimately, the real value of any learning experience, be it a classroom lesson or wilderness expedition, comes after the actual experience when the student is able to hear and own her/his own learning and apply it to a new situation. This is an echo: when a professor’s voice or interactive lesson or shared experience returns to serve as a navigation tool for the road ahead. (2) Dewey, J. (1897). My Pedagogic Creed in The School Journal, Volume LIV, Number 3 (January 16, 1897), pages 77-80. (3) Dewey, J. (1938). Experience and education. New York: Simon & Schuster. (4) La Prad, J., Mink, A. & O’Steen, B. (2008). Explore, Create, Harvest, Own: An Experiential Approach to Professional Development in The Confluence Proceedings, Adams, L. and Galloway, S., (Eds.). Outdoors New Zealand: Wellington, New Zealand. (5) Kolb, D. A., (1984). Experiential learning: Experience as the source of learning and development. Englewood Cliffs, NJ: Prentice Hall. by Jim La Prad and Andy Mink. You are currently browsing the www.Teo-Education.Com blog archives for August, 2010.